They're a talkative lot mostly. About a quarter so far have come by word-of-mouth directly from us and friends, about a quarter from the local press advertising and the other half were just passing - of the latter about half were locals and half tourists (from Birmingham and South Wales mostly). There's the occasional one (always male) who wanders into the shop, wanders around, and wanders out without saying a word. Paul can relate to that - he always used to be scared of going to garden centres in case they expected him to know stuff about plants. It is probably a man thing, he does the same at car boot sales. But in the main we like talkative customers, because they don't only talk to us, they'll talk to their friends too. 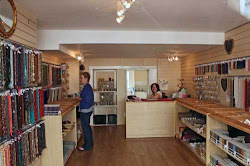 And so far, the feedback we had about the shop has been overwhelmingly positive. That's nice to know. And a lot of people have come back more than once. We do keep a list in the shop of stuff that people ask for but we haven't got. That's to try and help us get our stock right. So far the highlights are that we don't have any teardrop pearls and we don't have enough purple anythings! Need more purple. Ann is really good at the customer service stuff. The retail experience shows. Paul isn't yet - the lack of retail experience shows there. But he's getting the hang of it slowly. One thing we need to pay attention to is how to handle the shop when it is crowded. Two or three people is easy enough to manage, but if we get seven or eight in at a time we really need to be a lot faster at dealing with sales and questions so as not to keep other people waiting. Part of that is getting to know the stock so we don't have to keep looking up prices, and partly it is about getting slicker at the till. We're working on it. Perhaps the most common request we have had is to provide a comfy armchair for the long-suffering husbands of dedicated beaders. Ann says no to that because she suspects Paul will spend all his time sitting in it - besides, it would take up valuable selling space. But we do have a couple of chairs in the back room. If you need a chair, just ask.